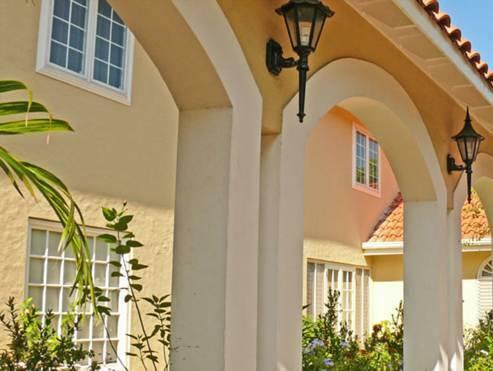 ﻿ Best Price on Polkerris Bed & Breakfast in Montego Bay + Reviews! The Polkerris Bed & Breakfast features an extensive garden, a lounge area with Caribbean Sea views, a terrace with a swimming pool and free breakfast. It is close to the Doctor's Cave Beach. The non-smoking rooms have a fan, safe, air conditioning, ceiling fans, mini-fridge and satellite or cable TV. The bathrooms are private and include a shower. Free Wi-Fi is available in all areas. They also have beach towels and ironing facilities. Guests at this bed and breakfast can find a variety of restaurants which serve international and local food half a mile. The Hi Lo Supermarket is just over half a mile away. You can enjoy this property by taking part in horseback riding, playing tennis or visiting the Half Moon Golf Course, which is 7 miles away. The Polkerris Bed & Breakfast is within walking distance of the Aqua Sol Theme Park and 2 miles from Sangster International Airport. The center of Montego Bay is just over half a mile away. Close to the hip-strip, Doc Cave beach and a 15 min. walk to the heart of Montego Bay City. Polkerris is located very close to the local attractions. The staff are attentive and friendly. The breakfast each morning was wonderful. The property is well maintained and very clean. We were very satisfied and will defineitly return. Jeremy and Clarissa were great hosts. Wonderful and they took realy good care of us.